We celebrate Veterans Day on November 11 because it marks the end of World War I, when hostilities formally ended on the 11th hour of the 11th day of the 11th month in 1918. The first Elon student to die in the service of our country did so during this conflict, nearly 100 years ago. This Veterans Day, let us remember Charles N. Whitelock. Charles was born and raised in Huntington, Indiana. He entered Elon in the fall of 1914. 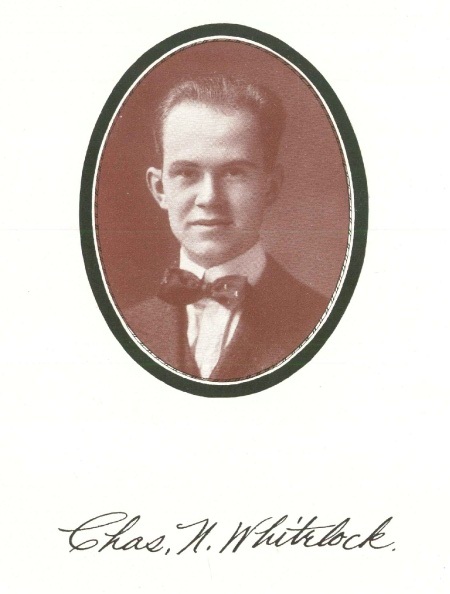 Charles took a leadership role at Elon, serving as the secretary/treasurer of his dorm during his sophomore year and being elected president of the YMCA in 1917. He was also active in the Clio literary society and in 1916 took part in a public debate arguing “that the United States government should make immediate provision for an extensive increase in armament.” Though he lost the debate, future events proved him right. 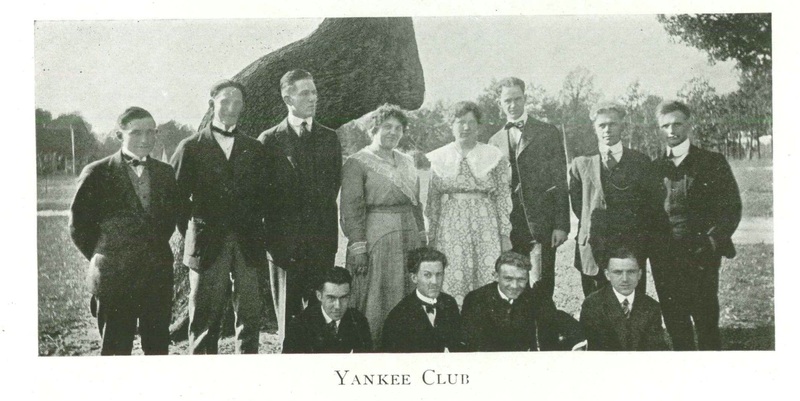 On a lighter note, Charles was also a member of the “Yankee Club,” an organization for students from the northern states. The war in Europe had begun in 1914, but America remained neutral until 1917. After extensive German submarine attacks against US ships, President Woodrow Wilson signed the congressional war resolution on April 6, 1917. That very day, three Elon students volunteered for service. Two weeks later Charles wrote to his father to request permission to leave college and join up. He received it, continuing a long, proud history of military service in his family. His great-great grandfather died in the War of 1812, his grandfather and two great-uncles died in the Civil War, and an uncle had just died in the Spanish American War in 1898. Charles immediately applied to an officer training program in Georgia, took the program’s examinations, and went home to Indiana to await the decision. Unfortunately he was denied entry, because of his age (he was only 20 and the conscription age was 21) and some sort of problems with his feet. Charles was very disappointed. He was also too young, by a mere five days, to enlist during the first conscription call on June 5. Charles was determined to serve and would not wait for his age group to be called; instead, he volunteered for the Red Cross Ambulance corps in August. Charles formally enlisted in Red Cross Ambulance Company No. 18 on August 4, 1917. On September 16 he was called to report to training at Camp Grant, Illinois. Sadly, his service lasted only a few short days. He developed appendicitis, which turned to peritonitis. Such common illnesses were often fatal before the discovery of penicillin, and so it was for Charles. Charles Whitelock died on October 4, 1917 at the age of 21. Charles was not the only member of the Elon community to serve in World War I. A total of 601 Elon students, faculty, and alumni served in the army, navy, air corps, and chaplaincy. The senior class shrank from 46 to 30 members as men enlisted. Fortunately there were only 15 Elon casualties during the conflict. Three other students died: Pvt. Herbert H. Barber, Sgt. William Frank Odom, and Cpt. John Carl Miller. These three and Charles Whitlock were awarded their degrees posthumously. Several other students were able to return to Elon to complete their studies after the war. 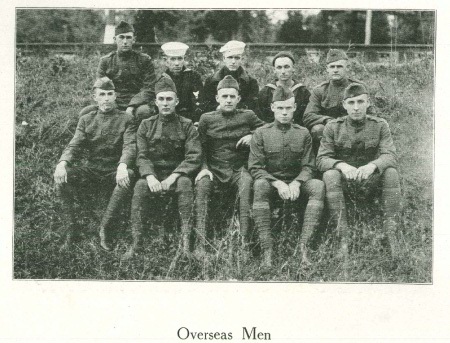 The returned soldiers formed a club called the “Overseas Men.” The class of 1920 honored those who served and those who lost their lives by dedicating the Phi Psi Cli yearbook to them. Though he was only a junior at the time, Charles Whitelock was slated to speak at commencement in May 1917. The topic of his oration was “Our Responsibility to our Democracy.” No words could have been more eloquent or persuasive than his actions and the example he set for his fellow students, then and now. We honor Charles and all who served. This entry was posted in Alumni, General Elon History, Student organizations. Bookmark the permalink.